Kriti Bardhan Gupta is an Associate Professor at its Centre for Food and Agribusiness Management. After completing his M. Tech. (Agri. Engineering) from Pantnagar in 1993 and Doctorate from IIM Ahmedabad in 1998, he has earlier worked at Institutes of national and international repute like Indian Institute of Technology, Kharagpur and Indian Institute of Foreign Trade, New Delhi. Prof. Gupta has presented several research papers in National and International seminars in India, USA, Hungary, Germany, South Africa etc. and published several of them in National and International journals. He has conducted several Executive Management Development Programmes for working executives at IIML, IIFT, IIT Kharagpur and Foreign Trade Training Center, Egypt. 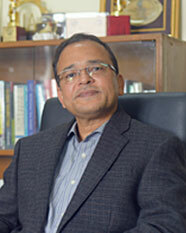 He has conducted several research and consultancy projects for government and private organizations in India and aborad. His current area of interest in teaching and research include Strategic Food Marketing, Marketing Models, International Trade, and Consumer Behaviour for Food Products. "A framework for Identification of Opportunities for Agribusiness and Agripreneurship in India", Journal of Management Research and Analysis, Vol 4, No. 1, 30-34, 2017. 'Sustainable Management of Water Scarcity in the Asia-Pacific Region Using Virtual Water Trade through Agricultural Products', Palawija, 30(3), 1-5. Centre for Alleviation of Poverty through Sustainable Agriculture, UN ESCAP, Indonesia., Dec 2013. "Efficiency in Agricultural Commodities Futures Markets in India: Evidence from Cointegration and Causality Tests”, Agricultural Finance Review, Vol 71(2), 162-178, 2011. "Water Footprint of India and Implications for International Trade of Food Products", South Asia Economic Journal, Vol. 9 (2), 419-433, 2008. "Structural Analysis and Performance of Indian Agricultural and Allied Sector in International Trade", Journal of International Business and Economics, Vol 7 (3), 35-53, 2007. M. Tech (Agri Engineering) from G.B. Pant University of Agriculture and Technology, Pantnagar. Value Chain Analysis of Selected Agricultural Produce in U.P. Export Potential of Handicraft Products from U.P. Preparation of Perspective Plan for National Rural Employment Guarantee Scheme for Certain Districts of U.P.